Our annual trip to Cub World at Alpine Scout Camp in Alpine, NJ is the highlight of the scouting year. We camp from Sunday to Wednesday, during which time our scouts enjoy numerous activities, including archery, BB shooting, rock climbing, arts & crafts and swimming. Visit the Pirate ship and Fort, dig for gold in the mine, or just relax at the campsite. A great time is guaranteed. All Scouts from Tiger on up are eligible to attend. The medical forms located here (below) and on the Cub World website are required to be filled out in entirety, which also requires a visit to the doctor for a physical. Forms are required to be turned in at or by the July Pack Night to ensure you can attend. Cost. For each scout registered prior to May 31 and paid in full, the price is $255. Parents are $30 each. After May 31, the price goes up to $285, parents remaining $30. Deposit. If you want the free tshirt, get registered with the Camping Coordinator, Marissa Terzino, or the Cubmaster and place a $40 per Scout deposit prior to Apr 1. After that, no free tshirt, but you are still welcome to register and go camping with the Pack. We can't stress enough how great this trip is. The boys get to go on adventures and learn skills toward advancement in ways we cannot create at den meetings. In fact, most boys will have most of their requirements met for the NEXT badge if they attend Cub World. See any leader or Scout that has been for more information on how much FUN this trip is. Scouting is about making FUN memories and this trip is nothing short of a lifetime worth! All campers, children and adults, must have a completed medical form. Part C of the form must be completed by a physician. We will hold our annual Registration BBQ event on September 15th from 11AM - 2PM. Those returning Cub Scouts can bring friends for new registrations at the same time they can register for this year's program. Program fees will remain unchanged. First Scout to register from a family is $100, each subsequent registration from the same family is $75. For Sr. Webelos, registration is just $75 as well. All Scouts need to have a registration form filled out (available at the event or online at https://filestore.scouting.org/filestore/pdf/524-406.pdf ). Typically, all boys will meet with their Den (boys of the same age) 2 to 3 times per month, during which time they will learn many skills and values they will carry with them for the rest of their lives. Cub Scouting is much more than meetings though. Pack 37 is a very active Pack. There is a saying that "Scouting is Outing", and that's the philosophy we follow. In the last year, our scouts have taken field trips to the United States Military Academy at West Point and The Intrepid. We also spent a night aboard the Battleship New Jersey. 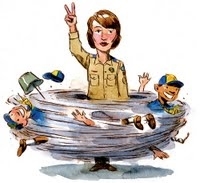 Those trips are in addition to three camping trips per year and almost weekly events we have planned at local parks or Nature Centers which allow our scouts to get away from the video games and come to appreciate the great outdoors. For the upcoming year, we are planning an overnight trip to the USS New Jersey battleship in Camden as well as visits to various educational and adventurous sites throughout the area. Click on the "Photo Gallery" link to see photos of past events. In addition to fun activities like field trips, we also emphasize service to our community. We have a number of service projects throughout the year. Our most important project is “Scouting for Food”, where we collect non-perishable items for the St. Teresa’s Food Pantry to feed the needy in our neighborhood. We also support a program known as Together We Rise whereby we assemble care packages for foster children to receive upon assignment to a family. In short, Cub Scouts is the most educational, cost effective and FUN activity your son can join. I hope you join us. Please e-mail me if you are interested. 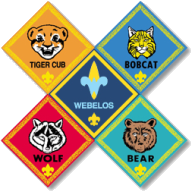 The new Cub Scout Program which began in June, 2015 requires that every Wolf, Bear or Webelos Scout camp at least one night. This is your last chance to complete this requirement for this year, Family Camping will take place from June 7-9 at Pouch Camp. We will be staying at the conveniently located Maple Cabin. You can sleep in the cabin or your own tent. All meals are provided.Cost is $20 per camper, Lions and siblings under 6 are free. If you're only coming for Saturday's festivities, then the cost is just $10. Activities in camp include fishing, hiking, fire-building, s'more making. We sing songs and each den conducts a skit at the Saturday evening campfire. On Saturday, each Scout will move up to their next rank. We'll conduct a ceremony and celebrate with a barbecue afterward. Camping really is a highlight of our program and all Scouts benefit from the experience!